Amazon.com is entering the mobile app business with an Android application store that features Amazon’s unique recommendation algorithm, a paid app for free every day, and free app testing on the Web site before purchase. The Amazon Appstore, which is accessible via Web and through a mobile app, is a potential iTunes equivalent for Android smartphones and tablets. Initially, users will have access to over 3,800 applications, including titles from Gameloft, Handmark and Glu Mobile. It even partnered with mobile game developer Rovio to launch its new Angry Birds Rio game exclusively on the Amazon Appstore. People are already used to buying things through Amazon and its mobile apps, giving them the experience and credibility required to break into the mobile apps market. Naturally, Amazon is also enabling one-click purchasing for anyone with a credit card on file. Unlike the Android Market, Amazon will review apps before they are sold. This works similarly to Apple’s App Store but with a more lenient approval process as Amazon “will only block an app if it doesn’t work or if it puts the customer’s data at risk,” Mr. Rubenson, category leader for the Appstore at Amazon, said. 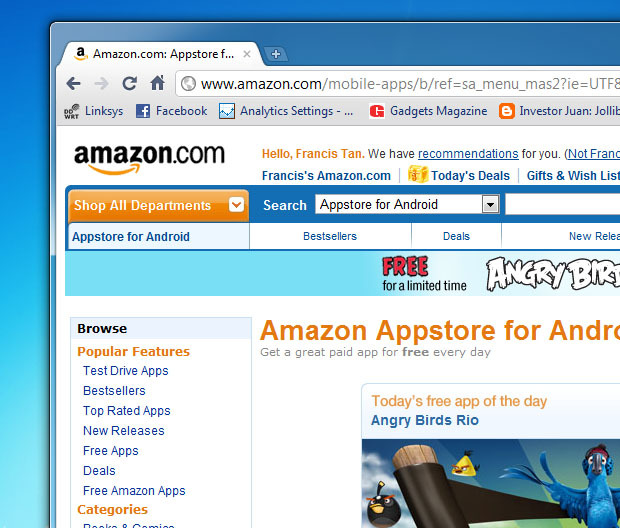 One surprise for app developers is that Amazon will set the prices the apps will sell for. Developers will suggest a price, but Amazon could sell them for a different price, which can even be less than the sale price on the Android Market. Amazon will pay developers 70 percent of the sale price or 20 percent of the price the developer suggests the app sells for, whichever is greater. Apple is already fighting back, with the Cupertino company suing Amazon for trademark infringement of the App Store name and unfair competition.